p.s. if anyone knows how to embed a gdrive image directly please let me know! Not easy to make out of pallets, well done! - how do you get the nails out? Nice job. What are the plastic bags doing? Is the roof not water proof? Looks like you have local mongrels. At some stage you may want to consider using the end holes - then the honey is stored to one side of the brood nest and not either side. That makes it easier for harvesting, but also in winter, the cluster tends to move one way to find honey, perhaps starving with honey at the other side. In order to make inspections possible, I start with one blank bar, against the end of the hive, then the follower and then the colony on its bars. So I can take out the bar and follower to get access. I hope that makes sense. All the best with that swarm settling down. If it is a recent swarm, some feed will help them get off to a good start building combs. 1:1 syrup white sugar/water. I know from your other post that the swarm sadly absconded but seeing the photo of the swarm clustered in the tree made me wonder if it had actually settled somewhere in your locality..... if that is the case, it may be that they were already considering an alternative home and you collected them just as they were making the decision to move there and that's where they headed off to. The hive interior definitely looks like it will benefit from gentle scorching and rubbing again with beeswax. Don't use linseed oil on the inside. The hive itself looks sound but I also prefer end entrances to centre entrances, for the reasons stated by Bridget. Not sure how water tight your slates on the roof are going to be and it will make the roof very heavy. I use mineral felt but many people recycle aluminium printers plates that I believe can be purchased on ebay for that purpose. At some stage you may want to consider using the end holes - then the honey is stored to one side of the brood nest and not either side. That makes it easier for harvesting, but also in winter, the cluster tends to move one way to find honey, perhaps starving with honey at the other side. In order to make inspections possible, I start with one blank bar, against the end of the hive, then the follower and then the colony on its bars. Yes - exactly that Bridget, I hadn't quite finished the roof when I got the call re the swarm, so had to shuffle one together! Either way, the bees didn't take to it unfortunately - so I've had time to make all the modifications suggested! I've put in end holes, left a single bar spacer, fitted a proper roof etc, so hopefully it's now more to their liking. Re: the pallets - it really depends on which you get! I make chicken houses out of them too, so have spent a few years smashing pallets up with varying degrees of success generating usable planks.. I find the easiest are the one with chipboard blocks holding them together, rather than the ones with 2x1" timber. With the pallet on a bench, slats perpendicular to the saw, I saw off the end 2" so the blocks are removed. You can the turn the pallet 90* and lever the long planks against each other to pop out the nails. Sometimes the planks snap, but you get a nack for it! I don't bother with the really skinny pallets, as they are too much effort!! it may be that they were already considering an alternative home and you collected them just as they were making the decision to move there and that's where they headed off to. That's an interesting point Barbara, that may well have been the case. A local beekeeper friend went over in the morning to shake that swarm into a box, and then I went over in the evening to collect them. Might they have already absconded by then if they'd chosen a home? Being new, it was the first swarm I'd seen, so I'm not sure what all the vital signs are yet!! Thanks for the extra tips - now the hive is empty I've added all the mods suggested, including light scorching the inside of the hive and exterior coating with linseed. I also made a hinged roof and end holes, I'll add some pics. I'd be interested to know if my floor looks OK. I initially had mesh on it, but added a wood board prior to adding the absconding swarm! Firstly, if that solid floor is not removable, then I would cut the mesh out....it looks like plastic, so a Stanley knife should do it. Debros from the hive will fall through it and the bees won't be able to remove it. 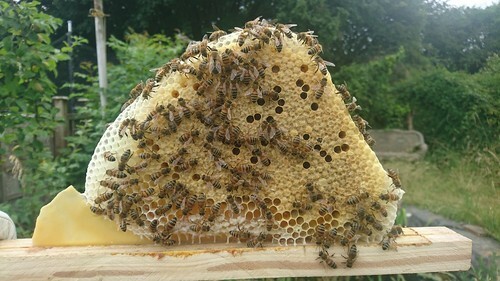 There are places where it will be slightly lifted or buckled and you will get wax moth breeding amongst the debris which could then infest the comb in the hive if the colony is not strong. The mesh is serving no purpose if the floor is fixed (I personally prefer either solid floors like this or the eco floor anyway) and just makes it difficult to keep clean both for you and the bees. 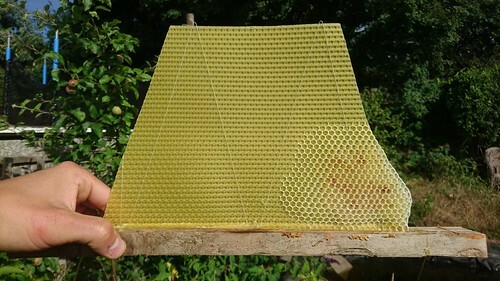 Plastic mesh floors on their own can be a risk as badgers can rip straight through them and attack the hive ravage the hive, so even if you were considering removing the wood at some point, the plastic makes it vulnerable. The saw cuts on your top bars extend right to the end. I have seen wasps access a hive through such small channels, so it is worth filling them. Lolly sticks look fine, I would just rub them with wax if you haven't already. The wax strips could probably do with being a little thinner and not so deep. Quarter of an inch protruding is probably better than more. Did you heat the top bars in the oven and then hold the wax strips into them until they melted and set? Did you make the strips themselves by dipping a thin slat of wood that had been soaked in cold water. into molten wax a few times and then scrape it off the slat? If you get snow in winter, you need to clear it off your landing board so that the bees can get in and out for cleansing flights when the sun comes out. It's one of those things that doesn't happen very often in the UK but is therefore easy to forget, especially as everything seems to grind to a halt when we do get snow so there are other things to think about and bees are not at the forefront. Angled landing boards are better as the snow usually slides off but they still need checking. Bees can suffocate as well as risk soiling the hive if they are blocked in by snow. 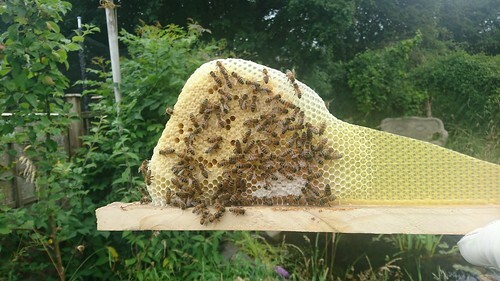 I would also fasten a string or chain between your roof and hive body to prevent it from accidentally swinging right back whilst you are doing an inspection and potentially tipping the hive over or at least causing a heavy jolt, which would upset the bees. I love the idea of a hinged lid, but I've not got around to doing it yet. Think that's all, off the top of my head..... they are very minor things so please don't think I'm being overly critical as on the whole, the hive is great. As regards the swarm absconding. They send out scouts to look for a new home whilst they are clustered. Those scouts will recruit other bees to look at whatever cavity they find. The more bees that look at a potential new site and get excited about it and recruit more bees, until they reach a tipping point.... it is likened to a democratic election with each scout canvassing for their chosen site and the more enthusiastic they are, the more likely they are to be successful in encouraging other bees to their cause. They demonstrate this enthusiasm by doing a waggle dance on the cluster. So if you go to collect a swarm and there is noticeable quivering going on, on the outside of the cluster, then it is likely that they have already found a new location and may be getting ready to move to it. Those people who have seen scout activity at an empty hive will usually describe it starting with a few bees over a couple of days, maybe even a week and gradually building up to a hundred or more bees checking it out, then there is a lull of half an hour or so before the swarm suddenly arrives. Whilst this is not always the case, it has been described by several people. Of course if the swarm is captured and moved away from the vicinity it was scouting in, then it cannot move to the site it might have chosen or be considering. They will generally scout within 200-300yard radius of the cluster, so unless your swarm was captured very locally to you, it is unlikely this was the reason for their departure. I hope that makes sense..... it's a very fascinating subject that Prof. Tom Seeley (Cornell University) did a lot of research on. The mesh is serving no purpose if the floor is fixed (I personally prefer either solid floors like this or the eco floor anyway) and just makes it difficult to keep clean both for you and the bees. Thanks Barbara - that makes sense - I think no I have a little time to work on it with no bees in I'll build a removable eco floor. Very helpful advice - thank you - can I just use bees wax to fill them in? OK - I'll cut them down. I poured molten beeswax onto baking paper, let it set, cut it into strips, placed it in the kerf, and then poured molten wax down either side to fix it in place. Good plan - I did this yesterday. The lid is now incredibly easy to use! Thank you for all your help and advice re: swarming too - it's really very helpful for a new (to be) keeper! That mesh wants to be removed even if you add an eco floor/trough so that the bees have access to the floor material..... I retro fitted my first eco floor with bees in situ and left the mesh between and was horrified to find that it was heaving with wax moth larvae after 6 months. 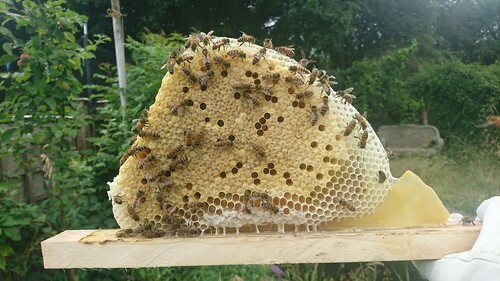 The bees must have had their work cut out, preventing all those wax moths from infesting their comb. Just so you know I speak from (bad) experience on this. Filling the saw cuts at the ends with wood glue and match sticks (heads removed of course) might be better than bees wax as again, wax moth like bees wax and crevices. You might find it easier to place the top bars in the oven at 100C for 15 mins and then hold the strips of wax into the groove. The edge in contact with the wood will initially melt and then set, forming a nice secure fix. 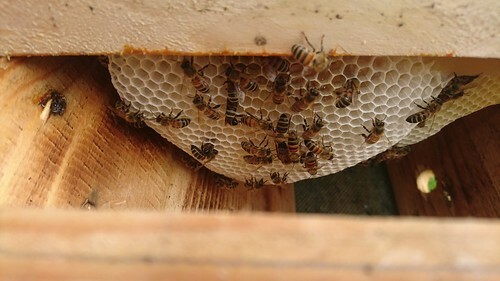 I also had an accident with a friend's hinged roof that wasn't anchored and went right over and crashed against the hive.... very embarrassing....but thankfully no serious damage although the bees were not impressed. Experience is all about learning from mistakes, but better if you can learn from others mistakes and then find new ones of your own to make. That is progress! Ah yes, match stick heads sound a much better plan - I'll use them. Good tip re: heating the top bars - I'll do exactly that - it was a bit of a trial run for that effort. Once I've got those bits done - it should be ready for an early Spring swarm unless any really late ones find their way in - in the garden over the weekend I did notice a couple of honey bees investigating it on their travels. Hi All - thanks for all the great advice last year. 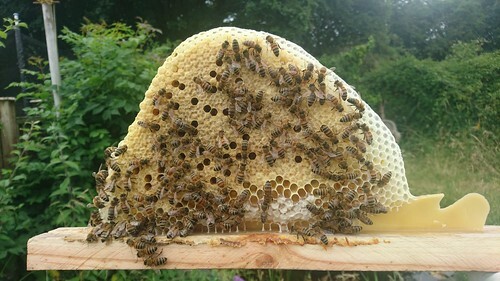 The hive lay dormant over the winter, but a kind local beekeeper managed to find a local cast swarm in May and they've settled in brilliantly. I added a couple of rows of foundation to a few of the bars to entice the bees to stay, but that might not have been necessary (I was given the foundation so it made sense to use it!). They've been in there about 5 weeks and there is already capped honey on some of the bars. 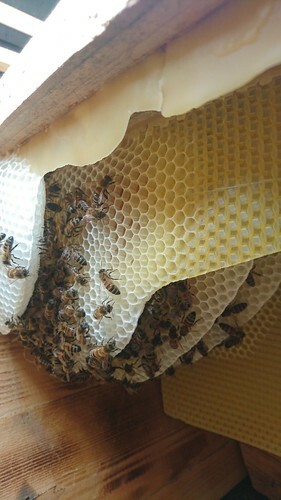 I haven't yet noticed brood, though haven't checked the two bars in the middle of the colony (there are 10 bars between the spacers, 8 are being used to draw comb) - how long after establishing can I expect to find brood? Do they establish honey reserves first? Delighted to read and see that you have tenants in your hive at last and that they have stayed this time. I am a little concerned however that they are capping honey as that is usually a low priority in the first 6-8weeks. Brood is the first essential after building some comb to rear it in and brood needs feeding and looking after, so there usually isn't enough workforce to bring in excess nectar and ripen into honey until the second generation hatches out..... they normally live more or less hand(honey stomach) to mouth during this early stage. Capped honey this early with a cast swarm suggests that they may be queenless or she has failed to mate...... but I suppose if you have been feeding them liberally with syrup, it may be possible that they have been able to lay down stores too. I would be tempted to do a full and careful inspection of all combs at this stage and if possible take photos of each side of each comb, so that you can peruse them at your leisure and also perhaps post them here. If they are queenless, at 5 weeks you are rapidly running out of time to help them. Good luck and I hope that capped honey is just as a result of you feeding them. 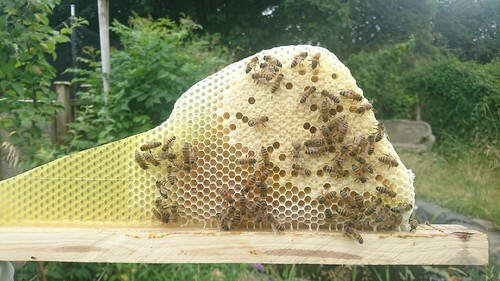 I can see there is a little pollen/bee bread in some of the comb, so that is a positive sign. Keeping my fingers crossed for you and them. I think the queen is top mid left in this shot? How does this look? There is a tiny amount of capped honey on the middle bars, but it looks like mostly capped worker brood? Should I expect any drone brood at this stage? As it happens - I did feed them using a tetra-pak feeder of sugar water that I saw on Phil Chandler's youtube page, just in case they needed it. 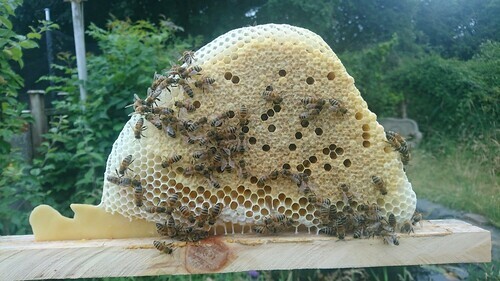 I guess that is why they draw the extra capped honey on the outer combs.